The Girls Basketball team (18-8) defeated Shortridge HS (15-9) 61-34 on Saturday night to win the 2019 IHSAA Sectional #43 title. The win marked the fifth consecutive sectional title. The Lady Warriors used a balanced scoring attack and a mixture of half court and full court pressure to force the Lady Blue Devils into several turnovers throughout the game. CCHS used that pressure to jump out to a quick 20-9 lead after the first eight minutes. Shortridge battled back to cut the lead to 20-16 in the middle of the second quarter before Covenant pushed the lead back out to 32-18 by halftime. The third quarter saw the Lady Warriors continue to stretch the lead, leading 48-26 after three. Senior Bailey Everett hit three 3-pointers on her way to a game-high 18 points. Juniors Sania Borom and Ilani Williams-Harris each netted 12 points, while Sophomore Bonnie Lew Ludlow added 11. Shortridge’s Junior Eryn Turner led the Lady Blue Devils with 13 points, while Sophomore Ella Garriott poured in 10. 2019 IHSAA Class 2A Girls Basketball State Tournament bracket. The win advances Covenant to Regional #11 at Speedway HS on Saturday, February 9. CCHS will face Western Boone HS (16-9) in the regional semifinal at 10:00 am. WeBo defeated Cloverdale HS (22-4) 62-56 in the Sectional #44 final. 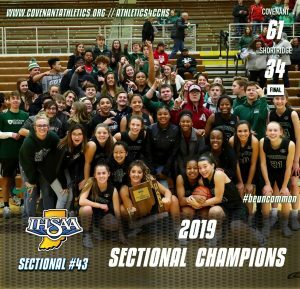 On the other side of the bracket, the Sectional #41 champion, Winchester HS (23-3), who defeated Northeastern HS 72-47 in their sectional title game, will face the Sectional #42 champion, Triton Central HS (23-1) at 12:oon. TCHS defeated Shenandoah HS 60-34 in the Sectional #42 title game.